Two ambitious Italian co-founders tackle the social networks business and gain confidence of investors with their determination. I have met Alessandro and Giorgio over a social dinning tonight in Berlin, where apparently they came to take the pulse of the city and to check what it has to offer to entrepreneurs (maybe establish office here? ), as well as to promote their platform: Ploonge. Very passionate and yet modest, they satisfied my curiosity about how they made it and what are their plans. And oh, by the way, they just signed a few days ago an investment of 300K euro from a VC fund, after another previous investment of 30K from a business angel. That is quite something for an Italian tech startup. Especially since they were not trying too hard (it was the first VC they got in contact for this matter, a VC that actually never invested before in internet startups, and they also received another offer from 3 business angels). But for them that is not the biggest achievement and did not make a big fuss around it (so this is the first media coverage). They are so determined to do it that they think this would have come anyway sooner or later. After all, they did bootstrapped for a year already, living and working from their own savings and dedicating themselves 100% for several months to build the beta platform that was launched in May this year during Milan Food Week. And the whole story started in San Francisco where the two have met for a startup course. One of them already had a startup running (youreporter.it), one just quit a good job to start working on what he believes in. Now their plans are to rework on the product, improving its design and user experience, and afterwards starting to promote it. The first niche they are targeting is social dinning, but after a while some other niches will be approached, building slowly a social network useful for offline situations when people want to expand their network (either when traveling to new cities, either in their own space when they want to meet new people). They are really keen on building a great product, through customer development, while making profit doesn’t seem to be a pressure (although they estimate the moment will come in about 3 years). Was a real pleasure to meet so relaxed and yet determined entrepreneurs and I wish them all the best. 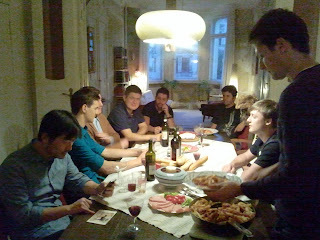 Was a great dinner too, a great mix between good Italian food and a bunch of interesting international people.